We already knew that Samsung was working on a standalone VR headset, and now we've glimpsed it. 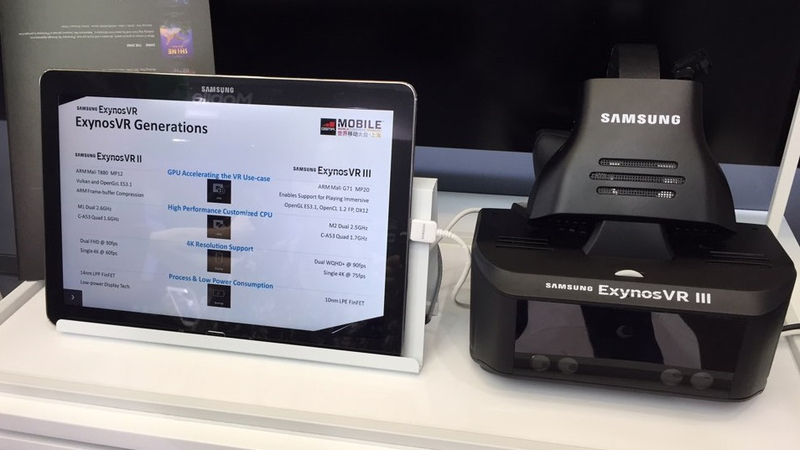 A prototype for the Samsung Exynos VR III was shown off at Mobile World Congress Shanghai just a few days ago, revealing a powerful all-in-one system with hand tracking, eye tracking and voice recognition. Korean company Visual Camp made the reveal in a press release announcing it was powering the headset's hand tracking abilities. The headset will also have facial recognition tracking, although how that might compare to something like MindMaze's tech remains to be seen. The headset is capable of powering two WQHD+ (Wide Quad High Definition) displays at 90Hz or one 4K display at 75Hz. Previous whisperings claimed Samsung's all-on-one would offer a display at 2,000 pixels per inch. So... it looks like it's going to be damn sharp. There's no direct reference to how movement tracking might work, but we'd expect an inside-out solution here giving you free movement in the style of the Pico Neo. The press release also mentions foveated rendering, the process where only the bits of screen being directly looked at are fully sharpened, reducing overall computational load. The other major thing here is that this would be Samsung's first standalone headset. Its Gear VR system's have to date all required the inclusion of a Galaxy smartphone to function. However the Exynos VR 3 is a reference design, much like Qualcomm's, so there's still a question over whether Samsung can cram all of the aforementioned goodies into one comfortable-to-wear device. We really hope it can.